How long is too long without a WIP? - "Artists Beware"
How long is too long without a WIP? I placed an order 2+ months ago with an artust and have yet to get a single WIP from them. They seem to be working out of order on their queue, that or it is so outdated I'm missing something as commussions being put out were for people not even on the list. Thr artist seems to always be posting new adopts on a nearly daily basis, and at this point after being told a month ago "I'm currently working on one comm now but when I get to a sketch for you I'll show it" I'm starting to think i wont ever get a WIP, and am about ready to ask for a refund. Just, am i being impatient, or do i have reason to worry that i might not get my art any time soon? Given what you've said I don't think you're impatient. Given the outright lie on your wip you have good cause to worry IMO. I also messaged them last night and they said they still dont have a WIP and to check their journal for my status, which i know isnt being updated. I mean do i wait longer or ask for a refund? That's up to you. I'd ask for a refund and if a full one isn't forthcoming quickly file a dispute with PayPal over it. But I've had enough artists flake on me that I no longer give the benefit of the doubt. If i dont see anything by the 3 month mark im going ti ask for a refund. I hope they don't give me any crap either for wanting one. They have all this time to bust out 3-6 adoptables at a time a week and keep getting money, they should be using that time to do their queue. I mean correct me if I'm wrong. +1 to everything gatekat said. In the future, before commissioning someone, ask what their turnaround time is and how long the queue is (as a timeframe, not how many people are in front of you). If it's 3 or more months or they can't give you a straight answer, don't commission them. I have told the artist that if I do not get a WIP by the 3 month mark I want a refund of my money. I also once again repeated that I believe their queue is outdated. Okay the artist just told me she won't refund me. "I delete slots as I near the end for them is why you don't see the people on there before I post their comm. 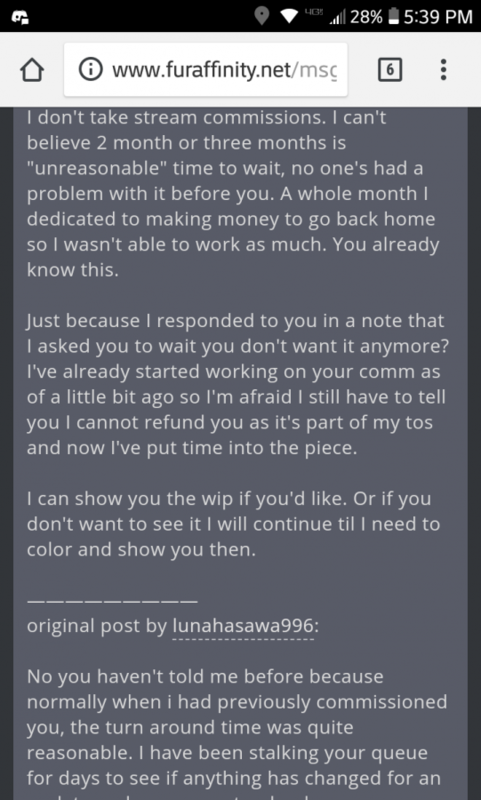 I don't do refunds as part of my tos as I think I've told you before it's even posted on my profile, you've done nothing but try and rush me since the beginning for this ych and I really don't appreciate it, you've seen my list and you know I have quite the workload on top of juggling rent and such for my living situation (I take care of several people in my home) as I don't have an outside job. I will get to yours as I've said and once I do I will show you a work in progress. If you continue to rush me your comm will be rushed as well. I would appreciate some patience ...and for you not to unnecessarily threaten me. I've gotten work for you done before there is no need for this. They can't deny a refund if they have no work done. Not even if they say so in their TOS. That is not legal. If they have started, they are only required to refund for work not completed. I would start a PayPal claim anyway since they say they won't refund. They are now saying because they have apparently started working on it, thry cant give me a refund and are trying to make me settle. Yikes. Honestly, I'd go for a chargeback after a response like that. There is absolutely nothing they can put in their TOS that legally allows them to keep your money when they've yet to show you any evidence of work completed. I’ve been there. Regardless, going by your story, you’re not at all impatient, The artist is clearly avoiding work on commissions they have no muse for, preferring whatever’s newer and has no guilt attached to. Always ask for a turn around & queue position upfront, screencap for evidence later should it go sour. With a WIP provided now after being threatened for a claim, i asked for a turn around time. It is sad it took being told "i want my money back" to get this person to do what they should have done before. It took them 1 hour to sketch over the prepose. Im not happy they made me wait 2+ months for something that took 1 hour to do. I have been given a 1 week turnaround for the piece. I will hold them to it. If you don't get it or it's not up to their standard then force the refund through paypal. Yikes. Given the responses fron the artist, I would be requesting a refund and out of there. Especially after the artist clained that /you/ were going to make them rush it as if any of that is your fault. If an artist doesnt like how a commissioner is acting towards them, they either need to just do the work so they can sever the relationship or just refund the money. They finished the work and posted it. Problem: they didn't even bother to inform me of this fact let aline send me the finished image via notes until I wrnt and asked. Really this will be the last time i get art from this person. I wish i could state who it was but i doubt I can. I only hope no one else has a similar issue with them. Yeah, it's not quite beware worthy, really, so I'm afraid you'll just have to chalk this up to personal experience and not recommend the artist to friends.